What is counselling and how does it work? Counselling in a Nutshell provides the answers to these questions and more, as part of a step-by-step guide to the counselling relationship and the therapeutic process. 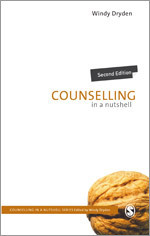 This revised and updated second edition also includes new material on person centred and psychodynamic counselling, further discussion of the influence of counselling contexts on the work of counsellors, and five discussion issues at the end of each chapter to stimulate thinking. Counselling in a Nutshell provides a concise introduction to core components of the therapeutic relationship and process and is suitable for counsellors of all orientations.